Thanks to everyone who joined us this week. Our gallery was filled with so many beautiful cards! I chose Jaydee's card because of its beautiful flowers and elegant simplicity! The stenciled background and small sentiment allow those fabulous (and sparkly) flowers to take center stage. 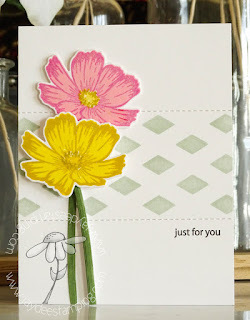 Visit Jaydee's blog for a closer look at those blooms! Congratulations, Jaydee, you are our Queen of Clean! Please join us next week for a new sketch designed by Kim! Linda, THANK YOU so much for choosing my card. What a great way to start my morning. I loved this sketch and had fun playing with it. There were some gorgeous cards in the gallery and congrats to all the other winners.